In 2018 Meder Beauty Science Laboratory released a new professional treatment, Red-Apax, designed to soothe, moisturise and restore the natural protection of the skin prone to constant redness, flushes and hypersensitivity. Today we are introducing the first item of corresponding home care: Red-Apax Mask! Let us remind you, what Meder Beauty Science masks are all about. All our masks are produced with the use of a unique technology: soaking golden bamboo fibre cloth in active gel. Due to its natural honeycomb structure bamboo fibre can hold a lot more liquid than the more commonly used cellulose. Soaked bamboo fibre is very elastic making it possible to stretch the mask over the whole face and secure it over the ears. During manufacture, dried-up bamboo cloth is put through a patented pressing process, during which the mask is soaked under high pressure in active gel based on hyaluronic acid and glycerine with active ingredients able to affect the deeper skin layers. Hyperbaric soaking technology allows every mask to absorb 30 ml of active gel — as much as a full bottle of concentrate! Innovative active exchange technology (we’re employing so-called hyaluronic and oleic bridge enhancing methods to create our masks) the ingredients of hyaluronic gel penetrate deep into the skin while the mask is absorbing and removing skin pollutants, including nanoparticles and toxins which settle on the skin in a polluted environment. Applying Meder Beauty Science mask once a week is sufficient to maintain the skin’s health and comfort and, depending on the mask’s type, affect various skin structures and cells. One of the key active agents in Red-Apax Mask’s hydrogel is Japanese sake extract, fermented probiotic yeast. The sake probiotic suppresses the activity of free radicals, boosts the skin’s regeneration and healing, restores the health and diversity of microbiome, improving the skin’s condition even in the presence of disease, lasting skin concerns and discomfort. Another important ingredient, the extract of Centella asiatica, has a powerful anti-inflammatory, draining and capillary strengthening effect. The extract’s active agents, madecassoside and asiaticoside, restore the capillary wall of microcapillaries, suppress inflammatory process and help remove the excess liquid from swollen tissue. To enhance regeneration, we use Panthenol (vitamin B5) — as its various benefits in treating burns and injuries have been confirmed by numerous scientific research. Panthenol quickly reduces redness and inflammatory changes in the skin, reduces both its sensitivity and reaction time to various irritants. Red-Apax Mask also contains the extracts of marigold (Calendula Officinalis) and chamomile (Chamomilla Recutita) with anti-inflammatory, soothing, healing and even anti-bacterial effect which further promote the restoration of healthy and balanced skin microbiome. 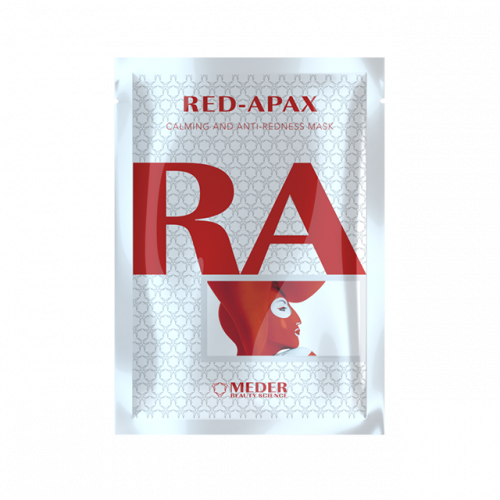 Like all Meder Beauty Science masks, Red-Apax Mask is enriched in peptide Skynasensyl with anti-allergy and anti-inflammatory effect which reduces the skin’s sensitivity and prevents the development of allergic reaction and contact dermatitis. After the first application of the mask the sensation of comfort is restored, the complexion looks more even, and the skin is brighter and calmer. For sensitive and easily reddening skin we recommend using Red-Apax Mask weekly. Another use of Red-Apax Mask is promoting and accelerating healing after all high-intensity treatments and chemical peels. We recommend applying a cooled down mask at the clinic immediately after the treatment and afterwards using cooled down masks daily for the following 4 days at home. This way the skin’s moisture levels and comfort will be preserved, side effects prevented, and the effect of treatment maximised. If you are planning a laser or energy-assisted treatment, please consider recovery period. You are highly likely to experience some degree of discomfort post-treatment. To reduce redness, pain and negative sensation and to accelerate your healing, we would recommend getting Red-Apax Mask. Get a pack of Red-Apax Mask. Discuss with your practitioner your recovery period and methods they offer to minimise your discomfort. If they don’t have a strategy for possible complications, side effects and general aftereffect of an energy-assisted treatment, consider going to a different practitioner. Let them know about Red-Apax Mask. Take one mask with you to your treatment and ask for it to be cooled down and applied immediately after. It will only take 20 minutes for the redness to be reduced and burning, itching and other negative sensations relieved. Store the remaining 4 masks in the fridge and apply a cool mask every morning for 4 days after the treatment. There you have it: pronounced results of your laser (or other energy-assisted) treatment, plus an added bonus of a shorter and more comfortable recovery.